An interesting collection had been done in a thread at Aeclectic ..
... to the German Lenormand, a deck with 36 cards, which was also object to DDD Wicked Pack of Cards (p. 141). DDD note c. 1850 for it, and they speak of an earlier game "Spiel der Hoffnung", found by Hoffmann, who dated it to c. 1800. Experimentalphysiker, Hersteller von Elektrisiermaschinen und Pionier beim Bau von Blitzableitern. * 25.3.1747 in Schwabach ; † 18.10.1827 in Nürnberg. 1. Heirat: Sophia Magdalena Kern (?-1782). 2. Heirat: 1788 Antonia Steingruber (?-1808), Enkelin des bekannten Ansbacher Baumeisters Johann David Steingruber (1702-1787). Kinder: Aus 1. Ehe ging der spätere Uhrmacher Friedrich Christoph Gütle hervor. Siegfried Kett schrieb zu Gütle: „Johann Conrad Gütle war ein Tausendsassa, der die verschiedensten Professionen wahrgenommen hat. Gelernt hat er als Buchbinder und Futteralmacher und sich im Laufe der Zeit autodidaktisch Kenntnisse in Physik und Mathematik angeeignet. Etwa ab 1780 war er als reisender Experimentator (Schausteller) unterwegs, wobei er auch schon Elektrisiermaschinen und Zubehör verkaufte und reparierte und nebenbei Kranke durch Elektrisieren heilte. In Heilbronn schalt man ihn deshalb als Betrüger. In Regensburg nennt ihn die ortsansässige Zeitung einen „hochfürstlich-ansbachischen Mechanicus.“ (Als ein Mechanicus galt damals nur ein sehr geschickter Handwerker, der die verschiedensten Materialien bearbeiten konnte und auch als Tüftler sehr erfinderisch sein musste. Christoph Gottlieb Murr zählt in seiner Beschreibung der Reichstadt Nürnberg von 1802 unter der Rubrik „Jetzt lebende Künstler in Nürnberg“ neben den Musikern, Malern, Kupferstechern und Bildhauern auch die „Mechaniker und physikalischen Künstler“ auf, zu denen er den seit 1788 in Nürnberg lebenden Gütle rechnet.) Bekannt ist Gütle vor allem als Produzent von Elektrisiermaschinen, als Trommler für den Blitzschutz und als Privatlehrer für Naturwissenschaften. In nicht wenigen Orten Frankens (auch in Nürnberg) hat er die ersten Blitzableiter eingerichtet und genoss dabei einen hervorragenden Ruf. In die internationale Literatur eingegangen ist er mit einer „elektrischen Lampe“, bei der mit Hilfe eines Elektrophors eine Gaslampe gezündet worden ist. Geschrieben hat er auch sehr viel, alleine die Bayerische Staatsbibliothek hat in ihrem Bestand 24 verschiedene Titel von ihm. Von Nürnberg aus betrieb er einen regen Versandhandel und stellte als ein „in der Chemie Beflissener“ zudem Reinigungs-, Schönheits- und Haarwuchsmittel her. Sogar der Dichter Jean Paul erwähnt in seinem Werk ein Haarfärbemittel von Gütle, mit dem seine weißen Haare wieder schwarz geworden sein sollen.“ Von Gütle hat sich eine aus Gips gefertigte waagrechte Tischsonnenuhr erhalten, auch veröffentlichte er 1797 ein Buch zur „Unterhaltung für Liebhaber der Sonnenuhrkunst“. This was a man with a lot of phantasy and inventions and many publications. Although his major interest had been in physics, it's easily possible, that he was also interested in games (and Nuremberg was traditionally a city for inventors and game producers). ... that also Hechtel wrote about physics. Further it's possibly of interest, that a protestant preacher with some literary interests wrote "Ein Denkmal für J.K Hechtel" ("A memorial for J.K. Hechtel") in the year 1800, so short after the tragical death of Hechtel in his 29th year. ... was only 2 years older than Hechtel, it might well be, that they were friends in their youth. If there's an interest in biographical details, this would be a place, where one could look. "Chator" is given as the author of the Petit Lenormand, a "heir of Lenormand", as the description says. Chator is a very rare French name ... between 1891-1816 existed 8 persons with this name, one of them in Central-Paris. Possibly "Chator" is a pseudonym, or the result of an error through abbreviation of an address. August Reiff is a minor publisher, in 1844 he made an address book of Coblenz. In 1846 there is another text published about an exploration in America, written by a Baron. The major book trader seems to be Hölscher (mentioned in the Lilith-note), who got the Petit Lenormand on commission. Another person with the surname Reiff (Johann Joseph Reiff) cooperated as author with a printer Hölscher about 20 years before. The Petit Lenormand reached Passau (with some greater distance from Coblenz or Koblenz) early in the year 1846 (February), so possibly one has to calculate, that the Petit Lenormand was produced 1845. Well, that's the momentary state of research. ... :-) ... it's about the "nice Rhein"
Thanks Huck. It's amazing to start seeing all this getting pieced together. Helen Riding summarized on the aeclectic history site a discussion we had of how the 15th century Italian Biribissi game may have led to the Spiel der Hoffnung (under Lenormand in the History section) and to modern day Bilderlotto. It also turns out that early tasseomancy emblem descriptions (c. 1860) focused on the same images as are found in the Lenomand deck. Now, if we can just find an 18th century German cartomancy tradition in which Clubs (Acorns?) are the worst suit, with Spades being good, and Diamonds being mixed (taking a gamble with big payoffs or losses), then we'll have another piece of the puzzle. These are the associations found between image and cards in the Lenormand deck. Hi Mary. Going back a few years now, I never did find the book that stated Clubs were 'bad' and Spades were 'good'. I finally concluded that it got moved out into the barn - buried in a box (or the dead Flatley Dryer) under junk. I can't search myself and dare not ask my SO without knowing its' title. But great to know that there are other leads. ... according which the publisher Reiff (likely August Reiff) not only distributed the Petit Lenormand, but also a Lenormand deck with 54 cards, so likely the Grand Lenormand, which according DDD p. 138-141 was made in 1845. Reiff mentioned a "Gräfin (German for "Countess") von ****** ", DDD notes a "Comtesse de ******* " as the inventor and the publication address 46 Rue Vivienne. The Snippet is from a book catalog made in 1848, but it presents both products with an "846", which means, that they should have been appeared at the market in the year 1846. ... Gallica offers book 4 (of 5), which accompanied the production of the deck. From this the system looks complex. Somehow it uses in this 4th part 60 gods, and each god gives 12 answers ... how this might relates to 54 divination cards, is for the moment a riddle. ... he studied a shorter time in Munich, where the "Spiel der Hoffnung" might have been well known (and where the first distribution of Petit Lenormand with Spiel-der-Hoffnung-motifs is documented for 1846). But Godefroy Engelmann was dead in 1839. The "Spiel der Hoffnung" is also given as "jeu de esperance" ... I remember dark. Yes, DDD, p. 141. Added later: No, it is not the same game. Its a dice game. Bee, how tantalizing. Here's hoping that you or your SO get into a cleaning out streak and come upon it! For some reason I keep thinking the answer to the card-image connection of the Spiel der Hoffnung is out there. You have pm re. suit of Clubs. The British Museum has advised that the original German game instructions will be made publicly available on their website within a few weeks. 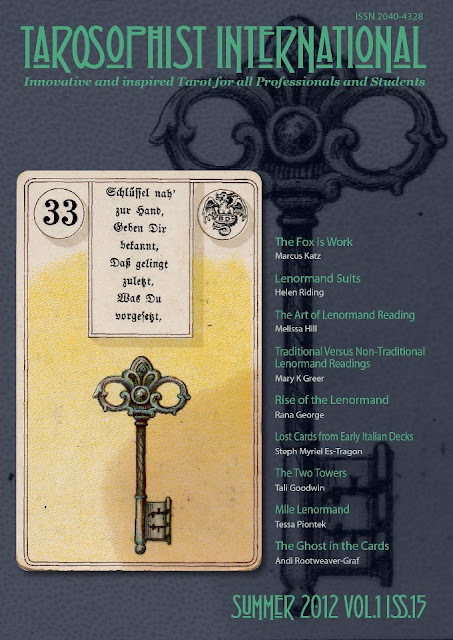 Tarot Professionals has also made an English translation done by Steph Myriel Es-Tragon for the book The New Lenormand now due out in 2013 available on The New Lenormand website. Thanks Huck, and thanks for the tip that led to Herr Hechtel. I am a group of one BTW, fortunately I have found a few others with the same interests in cyberspace. ... and thought, it must be "somehow" a group ... suddenly some massive English interest in the German Lenormand ... :-) ... if this is the major interest of the project. During our longer researches I was once astonished to find out, that in Germany this Lenormand version possibly has similar much interest as Tarot. One minor TV in Germany had or has a nasty cardreader show to earn money in a cruel, very insensible manner and I think more than 50% of the readers used Lenormand, not Tarot. In contrast Lilith, from which you got the note of 1846, who made long time an important Lenormand Internet Forum, is quite another character. Mary Greer wrote: Thanks Huck. It's amazing to start seeing all this getting pieced together. Helen Riding summarized on the aeclectic history site a discussion we had of how the 15th century Italian Biribissi game may have led to the Spiel der Hoffnung (under Lenormand in the History section) and to modern day Bilderlotto. It also turns out that early tasseomancy emblem descriptions (c. 1860) focused on the same images as are found in the Lenomand deck. Well, I think, that the research of the content of the Spiel der Hoffnung should start with knowledge about the first edition. DDD give only some short explanations. It's a racing game, and the cells (or at least a part of them) should have been defined by an accompanying text. The racing game is the major game, and the divination is only second use and one has to use 32 cards only ... this likely means, that the author took his information "from elsewhere". "From elsewhere" likely means "from Gütle", cause this man isn't far. Gütle (52 in 1799) is much older and more experienced than Hechtel (28), and it might be well so, that Gütle led Hechtel to literary activities and to the publisher Bieling. ... tells the story of a mill in a location "Roth" 33 km South of Nürnberg. In 1496 it was allowed to use it for the production of brass (German: Messing), beside its usual functions. Earlier, in 1443, brass production was already recorded in Roth. In 1772 mill and brass production was taken by a Lorenz Hechtel, and both went after his death in 1809 to the hands of his son Georg Hechtel. In 1830 the mill burnt down, was rebuild in 1832 and in 1854 sold to other hands. It seems plausible to assume Lorenz Hechtel as the father of the "Messingfabrik" owner Johann Kaspar Hechtel, and Georg Hechtel as the brother. ... so already the grandfather was a "Müllermeister"(mill-master) in Ansbach. DDD recognized an "Ansbacher pattern" for the German playing cards in the "Spiel der Hoffnung", but this means not too much, as the Ansbacher pattern was rather far spread. ... who had worked in Ansbach for more than 50 years. Starting as the son of a brick mason in low position, he later became architect and responsible for many buildings, especially in Ansbach. Well, Gütle married in second marriage (1788, one year after the death of the great archtect) the grand daughter Antonia of Steingruber. This marriage seems to have changed his life: In his biography it's noted "In Regensburg nennt ihn die ortsansässige Zeitung einen „hochfürstlich-ansbachischen Mechanicus.“ .. which seems to say, that they connected him (then) to the city Ansbach. 13 years before 1802 (so c. 1789) Gütle goes with new marriage and Antonia to Nuremberg. After a single publication in 1779 he now (1789) becomes an active author. In "blue" are marked works, with which he attempts to amuse with the help of tricks based on physical or chemical phenomena. In "green" are marked works, which are of interest for us, games (often with cards) and also some text about divination. This "green" period started in 1795. So there's some plausibility, that Gütle and the Hechtel family knew each other already from Ansbach. And Johann Caspar Hechtel took likely his knowledge of divination technology from Gütle ... or from Gütle's wife Antonia. Cause without Antonia the husband Gütle likely wouldn't have been a big author. Divination technology was more a female heme. Well, the strings of Hechtel and Gütle run together in Ansbach. But Ansbach is not only a city, but also a (small) state with same relationship to the royal Hohenzollern in Brandenburg and Prussia.